The top two teams in the East Sussex Football League Premier Division remain level on points after winning last weekend. Battle Baptists continue to lead the way on goal difference following their second 4-1 victory over Hawkhurst United in a fortnight, this time at home. Two goals for Corey Wheeler, and one each Jamie Lindsay and Dale Vinall gave Battle their eighth win in 10 league outings. Second-placed Bexhill Town, who have a game in hand on Battle, prevailed 4-3 at Sedlescombe Rangers. Doni Dovla’s double and one apiece by Ross Cook and Toby Clifford gave Bexhill the edge over a Sedlescombe side which netted through Kasey Smith (2) and Ben Gardner. Third-placed Robertsbridge United saw their six-match winning run ended by a 4-2 defeat away to Northiam 75 despite leading 1-0 at half time. A Scott Embery hat-trick and Kenny Butchers’ first goal for the club gave Northiam their first league points since September and moved them up two places to seventh. Curtis Coombes and Guy Ballard scored for Robertsbridge. Fourth-placed Sidley United received a walkover as scheduled hosts Bexhill AAC were unable to field a team. 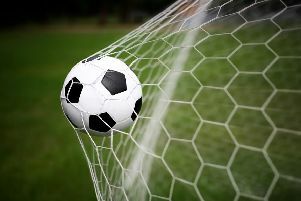 Rye Town ended a run of four games without a win and moved into the top half courtesy of a come-from-behind 2-1 success away to St Leonards Social. Andy Garman scored both Rye goals. Punnetts Town, Icklesham Casuals and Wadhurst United are all level on points at the summit of Division One, although Wadhurst have played fewer matches. The clash between Punnetts and Wadhurst ended goalless, meaning Wadhurst dropped their first points of the season. Icklesham climbed to second by virtue of a 10-3 triumph at home to Herstmonceux. Charlie Cornford and Liam Sayer netted hat-tricks, Kieran Dighton bagged a brace, and one apiece from Martin Tytherleigh and David Pugh completed Icklesham’s tally. William Hutchings (2) and David Chan replied for Ceux. Cameren Woodley plundered a hat-trick as Hollington United II rose to fifth via a 3-0 victory away to Mountfield United. Seventh-placed Bexhill United II made it seven points from a possible nine with a 4-2 win away to sixth-placed Crowhurst. David Ammoun, Ben Barton, Jack Matthews and Callum McDonald found the net for Bexhill, as did Jack Austen and Michael White for Crowhurst. Battle Baptists II are the new leaders of Division Two after strikes by Adam How and Ryan Jinks earned them a 2-0 success away to The JC Tackleway II. Previous pacesetters St Leonards Social II are now a point behind still unbeaten Battle having played an extra game following their 5-2 loss away to third-placed Rock-a-Nore. Fourth-placed Sedlescombe Rangers II were beaten 3-2 away to fifth-placed Wittersham. Sixth-placed Catsfield won 4-1 away to seventh-placed Peche Hill Select. Division Three top dogs Victoria Baptists made it five successive wins with a 2-1 victory away to Bexhill AAC II. Scott Oliver scored for sixth-placed AAC. Second-placed Bexhill Rovers remain five points behind with four games in hand following a 7-0 triumph at home to Orington. Iain Steuart-Pownall netted four times, Aaron Cochrane bagged a brace and Mark Phillips got the other. South Coast Athletico advanced to third by dint of a 4-2 win at home to Sandhurst, for whom Jason Baldock and Michael Peevor were on the scoresheet. The division’s other two matches produced 10-goal victories for Hawkhurst United II and Magham Down. Hawkhurst rose to fifth by winning 10-3 at home to a Bexhill Rovers team which has dropped to fourth. Jack Brockhurst (2) and Matthew Stephens netted for Rovers. Magham Down won 10-0 in the battle of the bottom two at home to Pebsham Sibex. Tyler Capon and Steven Cherryman scored four goals apiece, and Matthew Sedgwick and Shaun Smith chipped in with the others. Hampden Park are still four points clear at the summit of Division Four following a 4-0 win at home to Sedlescombe Rangers III. Second-placed Northiam 75 II, who have played two matches fewer than Park, were made to work for a 5-3 success away to Ticehurst. Hayden Reed (2), Ben Thwaites, Luke Townsend and Alex Neville were Northiam’s scorers. Cranbrook Town climbed to fourth by virtue of a 2-1 victory away to third-placed Sovereign Saints II, who they now trail by just a point having played two less matches. Harry Gooch scored the only goal as second-bottom Battle Baptists III recorded a very good 1-0 win away to a Parkfield side which dropped to fifth. The big game at the top of Division Five ended in a 4-3 victory for third-placed AFC Hollington at home to leaders Little Common III. Andrew McTear, Sam Slayford and Ben Gardner notched for Common, who are now just three points better off than Hollington having played two more fixtures. Second-placed Welcroft Park Rangers are three points behind Common with a game in hand after winning 3-0 away to Herstmonceux II. Jordon Cull, Darren Weller and Charlie Smith were the scorers. Fifth-placed Burwash won 4-3 at home to fourth-placed Hooe. Kenny Davison Mitchell, Liam Elphick and Jack Kitto were the Hooe scorers.